The most powerful pump pre-workout available is now even stronger! Stimulant free and can stack with any pre-workout for maximum results. Powered by clinically studied effective ingredients. Feel long lasting pump with no tingles or jitters! Enhance muscle performance with more oxygen and nutrient delivery! Superhuman endurance & performance boosts workouts! Stack with any pre-workout to ramp up performance. This amazing product stimulates nitric oxide production & greatly boosts your performance in the gym! The best part about this amplifier? Just 1 scoop is incredibly effective on its own, or you can stack with Ritual or Prophecy for an unparalleled experience in the gym. 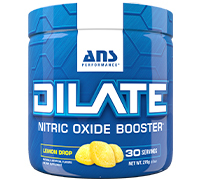 Directions For DILATE Powder: Mix 1 scoop of DILATE™ with 10-12 oz of cold water and consume 15-30 minutes before training. 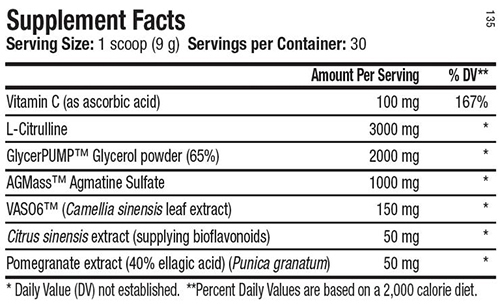 Dose may be increased up to a maximum of 2 scoops for maximum effect (mixed in 20-24 oz of water). For enhanced endurance, DILATE can also be taken during training or combined with your favorite intra-workout beverage. Read entire label before use. DO NOT EXCEED 2 SCOOPS IN ANY 24-HOUR PERIOD. Warnings: Not intended for use by persons under 18. Do not use this product if you are nursing, pregnant, or attempting to become pregnant. Consult a medical doctor before starting any diet or exercise program. Consult a physician if you have any pre-existing medical conditions or if you are using any prescription or over the counter medication. Discontinue use and consult your health care professional if you experience any adverse health effects from this product. This product may contain ingredients banned by certain sports organizations. User accepts all risks, liabilities, and consequences in regard to testing. Use only as directed. Do not exceed recommended serving under any circumstances. Do not use if packaging has been tampered with. Store in a cool dry place. KEEP OUT REACH OF CHILDREN.